The appointment of the notorious warmonger John Bolton as National Security Advisor is the latest move in reorganizing the Trump inner circle as a war cabinet. The Bolton announcement came just days after the naming of Central Intelligence Agency director Mike Pompeo as Secretary of State replacing Rex Tillerson, and Pompeo’s replacement at the CIA by Gina Haspel. Both Pompeo and Haspel are advocates of torture, and Haspel personally supervised torture at a CIA secret site in Thailand, later destroying the video tapes documenting waterboarding and other abuse of prisoners kidnapped and brought there. Bolton has a long history of advocating the most belligerent policies toward Russia and earlier the Soviet Union. He has called Russia’s alleged “meddling” in the U.S. election “a casus belli, a true act of war, and one Washington will never tolerate,” a statement that highlights what a menacing character Bolton is. A U.S.-Russia war would be one between the leading nuclear weapons states and would have the potential of destroying life on the planet, a consequence that doesn’t faze Bolton–just the opposite. “The next step in the bilateral relationship with Russia,” he recently wrote, “is for this administration to abrogate the New START Treaty,” a nuclear arms reduction agreement between Russia and the U.S. in 2010. 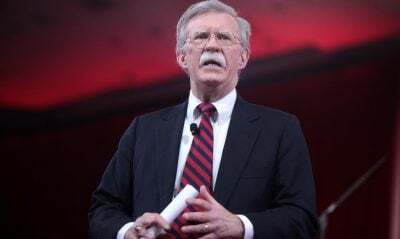 A gung-ho supporter of the Iraq War, Bolton advocated that it be followed by similar regime-change wars against Syria and Iran, as well as North Korea. Bolton worked closely with Israeli intelligence to fabricate a falsified “weapons-of-mass-destruction” justification for an assault on Iran after the occupation of Iraq, which top Bush officials had predicted would be a “cakewalk.” It was anything but, and it was the fierce resistance in Iraq that was the key factor in preventing a new war on Iran at that time. Bolton, like Trump and Pompeo, wants to overturn the Joint Comprehensive Plan of Action, signed in 2015 by the five permanent members of the UN Security Council, Germany and Iran. It called for severe limitations on Iran’s nuclear program for 15 years in exchange for an end to the harsh sanction that were strangling Iran’s economy. According to the International Atomic Energy Agency which conducts on-going inspections, Iran has met all the requirements of the agreement. It is expected that Trump will pull the U.S. out of the JCPOA in May 2018, heightening the threat of a new war in the Middle East. On February 28, when he undoubtedly already knew that Trump was preparing to appoint him, Bolton published a piece in the Wall Street Journal under the headline, “The Legal Case for Striking North Korea First.” The op-ed reads, “It is perfectly legitimate for the United States to respond to the current ‘necessity’ posed by North Korea’s nuclear weapons by striking first.” In fact, of course such an attack would be a war crime of the highest order. While Trump surprised many by announcing that he would meet with North Korean leader Kim Jong-Un, by May of this year, a recent Bolton interview with a Washington DC radio station raised serious questions about whether the negotiations will actually take place. The most extreme Zionists in both Israel and the U.S. are celebrating the Bolton appointment. Bolton has expressed undying support for the apartheid Israeli state and complete disdain for the Palestinian people and their right to self-determination. He has advocated what he calls the “three-state solution,” turning over remnants of the West Bank that Israel doesn’t want to annex to Jordan, and Gaza to Egypt. The elevation of Bolton, Pompeo and Haspel can only be seen as a turn in the direction of new war and intensification of the seven wars the U.S. is already engaged in. Now is the time to intensify the resistance.